With the increasing demand for smaller, faster, and more highly integrated optical and electronic devices, as well as extremely sensitive detectors for biomedical and environmental applications, a field called nano-optics or nano-photonics/electronics is emerging – studying the many promising optical properties of nanostructures. Like nanotechnology itself, it is a rapidly evolving and changing field – but because of strong research activity in optical communication and related devices, combined with the intensive work on nanotechnology, nano-optics is shaping up fast to be a field with a promising future. 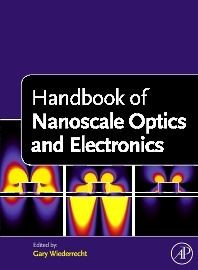 This book serves as a one-stop review of modern nano-optical/photonic and nano-electronic techniques, applications, and developments. A one-stop review of modern nano-optical/photonic and nano-electronic techniques, applications, and developments. Materials scientists, chemists, physicists, (telecommunications, computer) engineers, surface and physical chemists, advanced undergraduate and graduate students in electrical and electronic engineering, nanoscience, materials, bioengineering and chemical engineering. Gary Wiederrecht is the Group Leader of the Nanophotonics Group in the Center for Nanoscale Materials at Argonne National Laboratory. His research interests center on the photochemistry and photophysics of nanoparticles and periodic assemblies, hybrid nanostructures, photochemical energy conversion, and non-linear optical responses resulting from photoinduced charge separation. His experimental expertise is in the areas of ultrafast optical spectroscopy and scanning probe microscopy, including near-field scanning optical microscopy. He has received an R&D100 award, the Department of Energy Young Scientist Award, and the Presidential Early Career Award for Scientists and Engineers. He has authored or co-authored approximately 80 peer-reviewed research articles, and works collaboratively with scientists around the world. He enjoys traveling, nature, and spending time with his family.